Exalted solution as a PDF password remover is designed by eSoftTools experts for helping those users who are looking for any way to make PDF file free from any kind of software parameters. Password securities are used for security purpose but in any scenario if users find issue to open PDF files and unlock PDF file password then they can use our PDF password security remover software. PDF Security Remover Software preserve all PDF database during removing the password and provides secure process to remove PDF file password and allows use PDF files without any protection. Tested over 18,000+ PDF file password remover at a time. Have Demo Version- PDF Password Remover Software-Trail demo version of PDF Password Remover Software and get know all software process to remove the protection from PDF files. 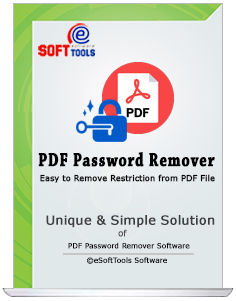 As we mentioned above that eSoftTools PDF password remover is available to take apart PDF files from password security and makes users able to open it, then the best thing to know here about software is that, users can make changes or edit over PDF after removing password. Download this tool immediately and remove password security from PDF file with 100% surety. 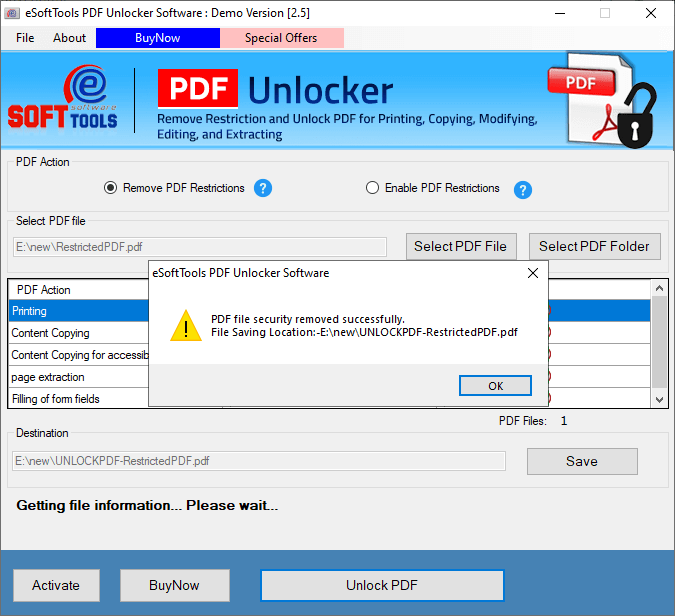 Safe tool to unlock, break and remove PDF security easily. 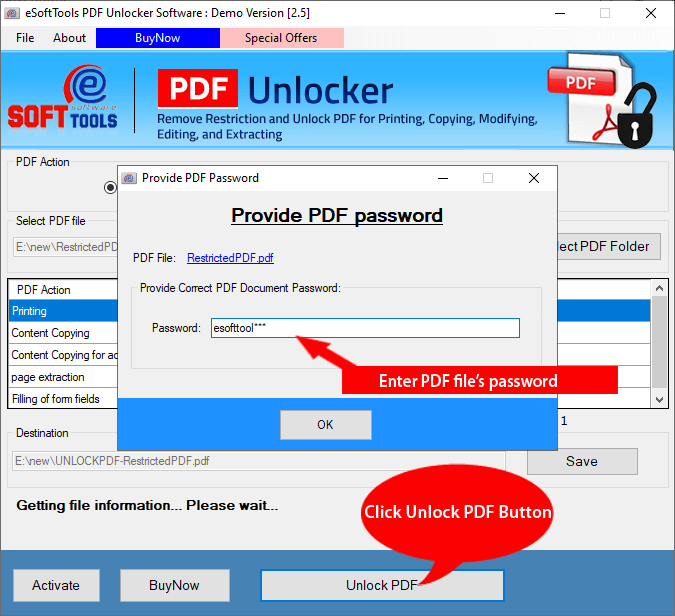 After making PDF file password protection-free, the PDF Password Remover Software allow users to save PDF file separately in new folder by choosing new location and all data will be secured at the time of removing protection. It means the PDF Password Remover software is safe and secure to use application that never destroys data formatting. It keeps data safe & secure and never creates any issue like data loss while unlocking the protection from PDF documents. 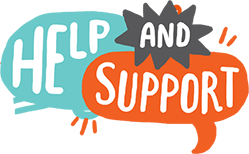 After removing all securities from PDF file, PDF Password Recovery software gives you full admittance on PDF file so that user can make any change over it according to their requirement and use PDF file the way they want without facing any difficulty. The given application is compatible on all adobe acrobat reader and Windows versions. Therefore, this is all user application allow everyone to use and take advantage of given benefits. So, with fully protection install this application and remove the protection of PDF file. Use Demo Version of PDF Password Recovery Software -Use free demo offered by eSoftTools for user satisfaction. With demo, you can Remove PDF File Password Protection, unlock PDF file but with water mark. To get full access on PDF file, purchase full version which is available at affordable price. One thing I wanna say about the software that its easy installation process helped me to remove protection from PDF file. Very nice steps provided, I liked and very easy remove the protection from PDF file……thanks a lot…..